supplying the bowel with both probiotics and prebiotics. 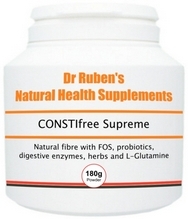 CONSTIfree supplies the bowel with soluble fibre from psyllium husks, which act as a bulking agent in the bowel. The fibre works like an internal "brush", sweeping waste and toxins down the bowel and out of the body. This powder supplement is useful for people with low-fibre diets and those who experience “pellet like” stools and the feeling of non-evacuation. Combine with our strong oxygen therapy bowel cleanser OXY-KLENZ, or herbal colon cleansers COL-Clear A and COL-Clear B. A natural solution for body waste cleanse! 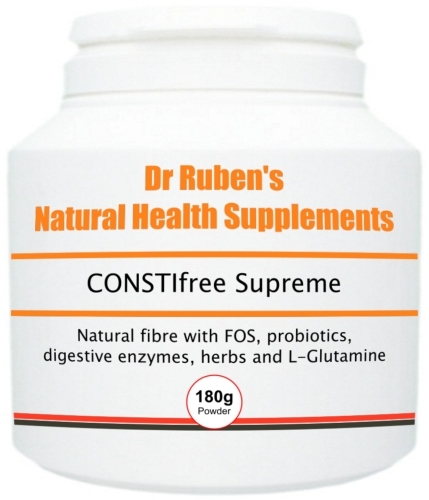 NOTE: CONSTIfree contains a minimum of 36 servings per tub, based on 5g servings. Take 1 - 2 heaped teaspoons (approx. 5 - 10g) mixed in water, 1 - 2 times per day and 10 minutes before a meal. Ideally follow this high dietary fibre colon cleanse powder with a glass of water (try to drink 250ml of liquid to every teaspoon of powder). Best results are achieved when CONSTIfree is taken continuously for 2 - 3 months, together with improved eating habits. NOTE: Included in each pot is a small food grade approved sachet to ensure the product remains unaffected by moisture after it is opened for use. As stated on the sachet, “do not eat”.